As we left the wineries and cypress trees of Tuscany behind, we entered the rolling hills, and less traveled area of Umbria. You don’t hear of many people visiting this area, due to its more popular sibling – Tuscany – but I fear it is overlooked based purely on lack of publicity. Our time in Umbria felt more rustic than any place on our trip and we encountered more pure culture and non-English speakers than I ever could have imagined. We called it our “cultural immersion” part of the journey. No Rick Steves guidebooks here. 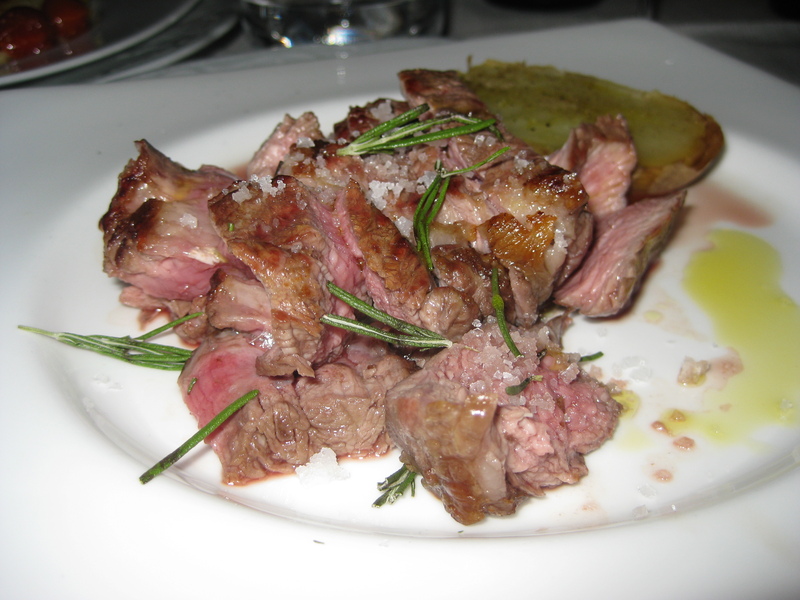 Although the cuisine is similar to Tuscany, there are a few regional specialties worth noting. Perugia is known for its chocolate, so the delicious sweet treat is easy to come by in these parts. Truffles are also popular and abundant. 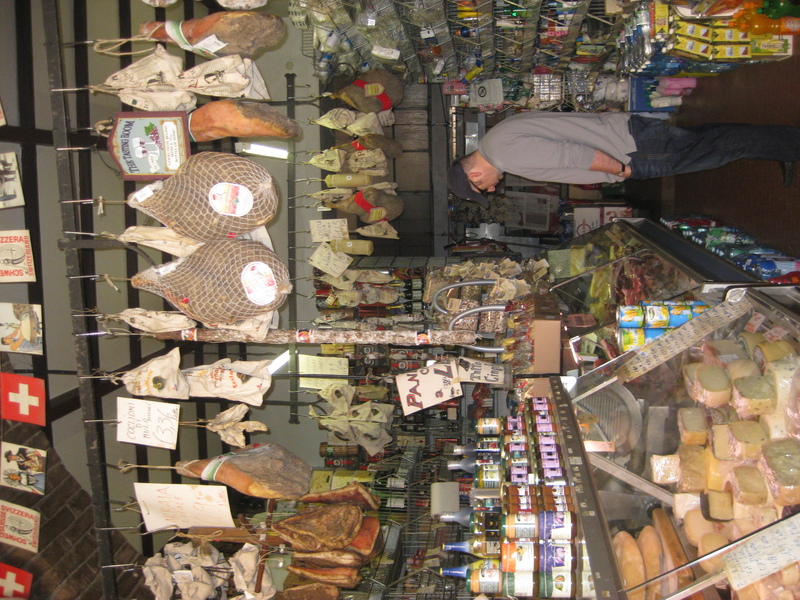 This area is also supposed to have the best salumi (which we later confirmed). So our first stop (which we got to via our Fiat Cinquecento and first interesting driving experience) was Orvieto. This small hill town is known for its amazing duomo (the most beautiful I have ever seen) and its wine called, of course, Orvieto Classico. 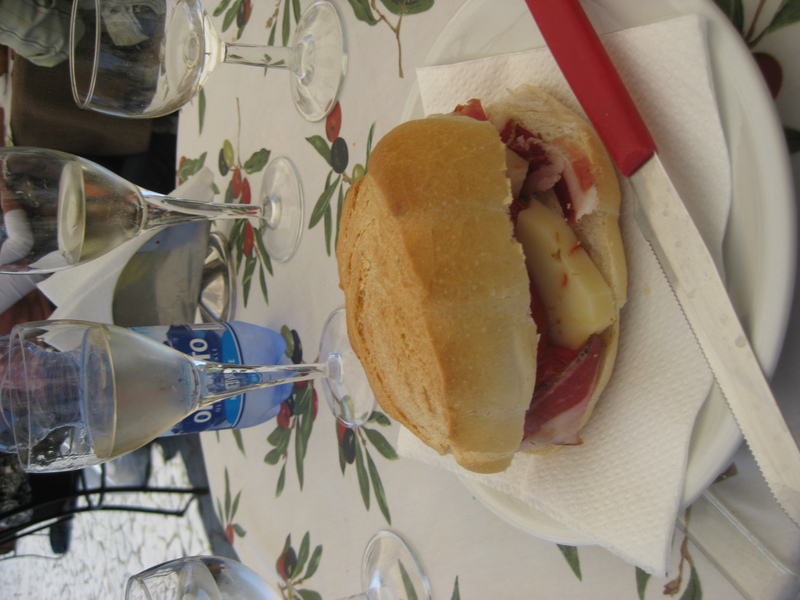 So, not in order of importance, we visited the duomo, then tried the wine with lunch. 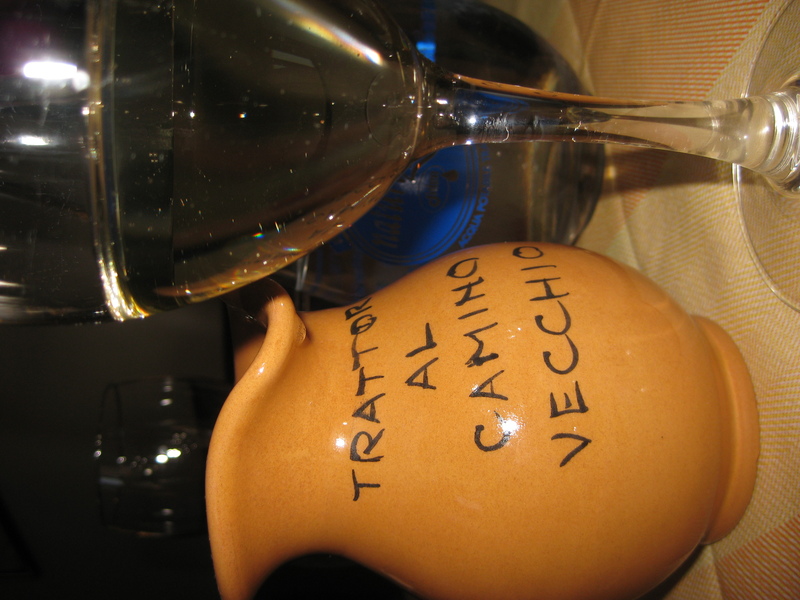 In Cinque Terre the light wine felt right with the seafood and sea views – but here, I will admit, it was a bit odd. The food in this region is very pork, boar, tomato-sauce focused so it felt ripe for red. But, when we found a restaurant on the square with a view of the duomo and ordered a panini, the white, light wine went perfectly. 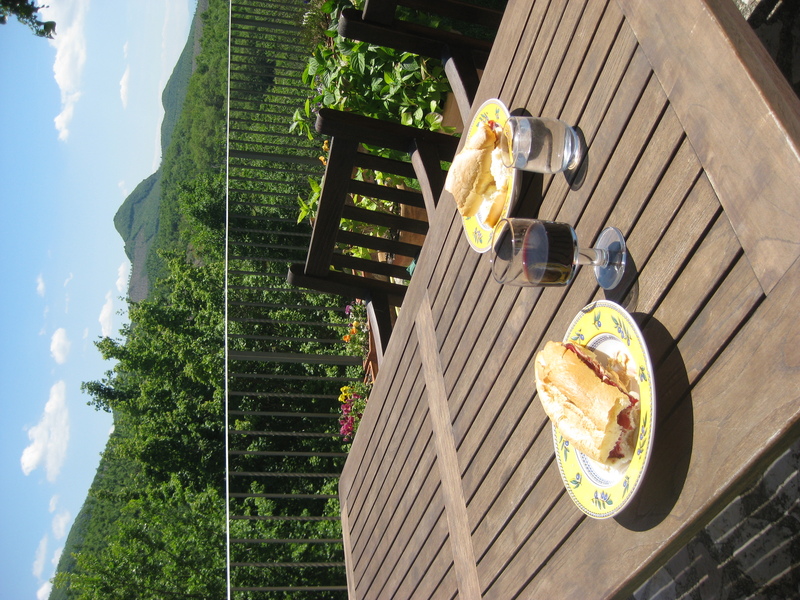 After our short lunch stop in Orvieto we proceeded (sans GPS, unfortunately) to our villa. We were fortunate enough to have a work friend who knew an old coworker with a cluster of villas just outside of Spoleto (http://www.borgoacquaiura.it/borgoeng.html). We knew it would be off the beaten path and absolutely amazing. We were not disappointed. 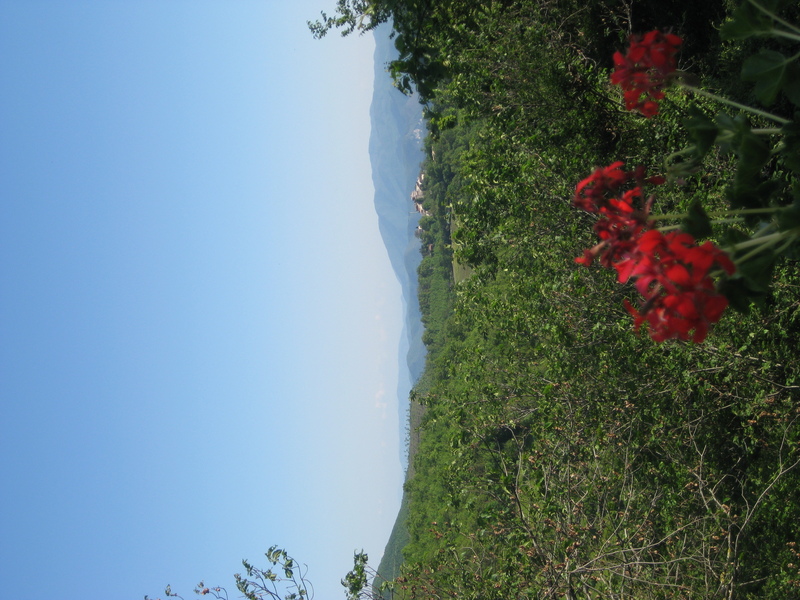 The villa was situated on a hill, overlooking nothing but trees, flowers and a few small hill towns. Our villa, La Casetta, was the perfect home base. To add to the ambiance, we were greeted by the caretaker, Nicu, who knew absolutely no English. Remember how we called this our cultural immersion? should drive for dinner. We knew how to get to Spoleto, but didn’t know much about what was there. In broken Italian, we asked Nicu who kindly offered to drive us to a restaurant called Palazzo del Papa, which was down some windy roads opposite of Spoleto. To boot, he said when we were finished to tell the wait staff and they would call him to come pick us up. 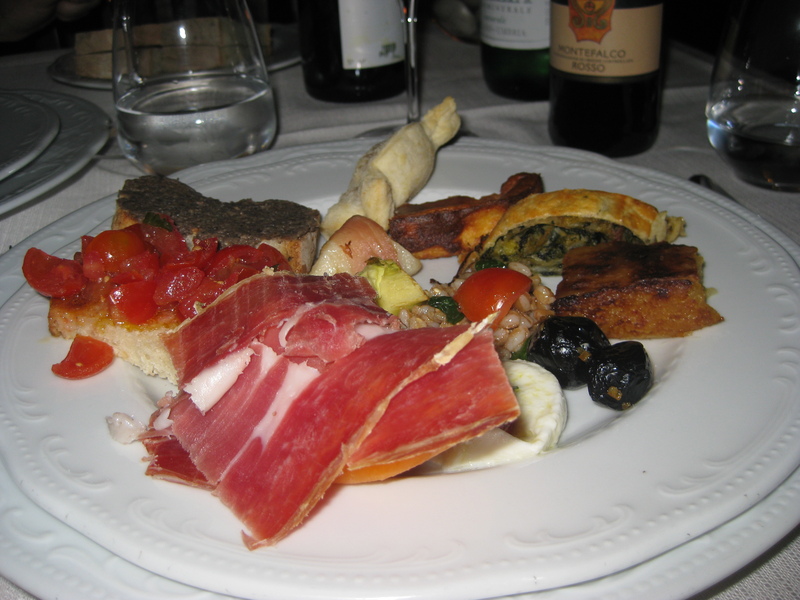 So our first course was, of course, the antipasti of the house – again, it was interesting to see the difference. 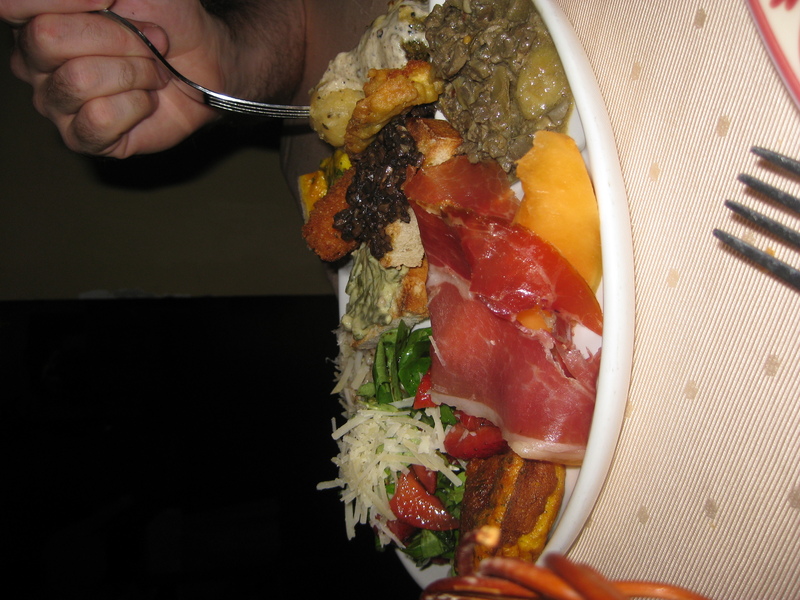 Of all the places we had been, this was the most robust and hearty antipasti we had ever eaten. In some ways, it could have been its own meal. But, there was just too much good food to stop there! For our primi, I got a truffle pasta (although I actually ordered something else – but the language barrier was a blessing since it was amazing!). Rob had a tomato pasta then we both had pork cutlets (his with lemon and mine with truffle – that time ordered on purpose!). The food was to die for, and when we had the restaurant call Nicu, the bartender gave us a gratis after dinner drink while we waited. An amazing night. The next night was a special one – and I won’t bore you with ALL of the mushy details. My husband and I renewed our vows. No, it wasn’t a monumental anniversary, but we had always wondered what it would be like if we had eloped to Italy, and got married in a chapel – just us. Now, at the end of the day, having our friends and family with us that day was so important to us, we never would have done it. But there was something about a romantic moment, just the two of us, in a foreign place that always tugged at me. So, when the coworker who put me in contact with the villa owner said he renewed his vows there, we thought it would be the perfect opportunity. as the popemobile. He drove us to a church in Torrecola – population 24. Electricity had to be run from a neighboring house, the townspeople came to join us (none of whom we knew) and the entire ceremony was in Italian. But I can honestly say, there was something so surreal about that moment, that I felt not only a romantic and religious connection to my husband, but also to the land of Italy. Truly a once in a lifetime experience. chin” nearby, we had dinner reservations at a place we had been hearing about ever since we got there – Il Capanno (http://www.ilcapannoristorante.it/). Now you can’t be fooled by the dirt road that gets you there, and the fact that it isn’t near much of anything (except our villa). We went there the night before – Nicu took us to make sure it was “acceptable” for our celebration. 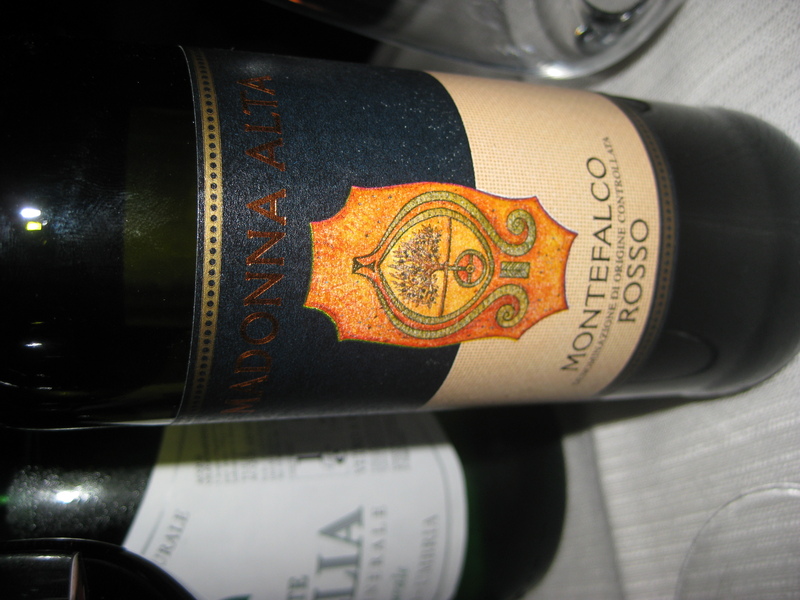 They gave us wine, antipasti and we tried to communicate with the adorable girl Raquella who was there with the family. We knew it was good, and we knew it was a gem that not enough people had discovered. steak. I feel like in my life I have had some pretty good steaks, all over the country. But this steak had some sort of unique salt crust, and it blew you away. I could never reciprocate it no matter how hard I would try. We both agreed it was hands down the most amazing steak we had ever hand in our lives. 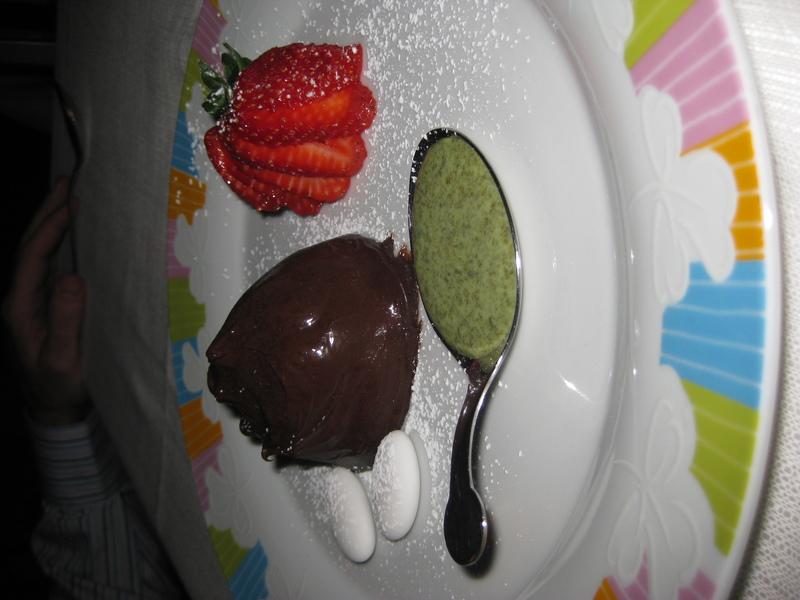 For dessert, we got a chocolate mousse with a pistachio creme that was the perfect ending to a perfect meal. 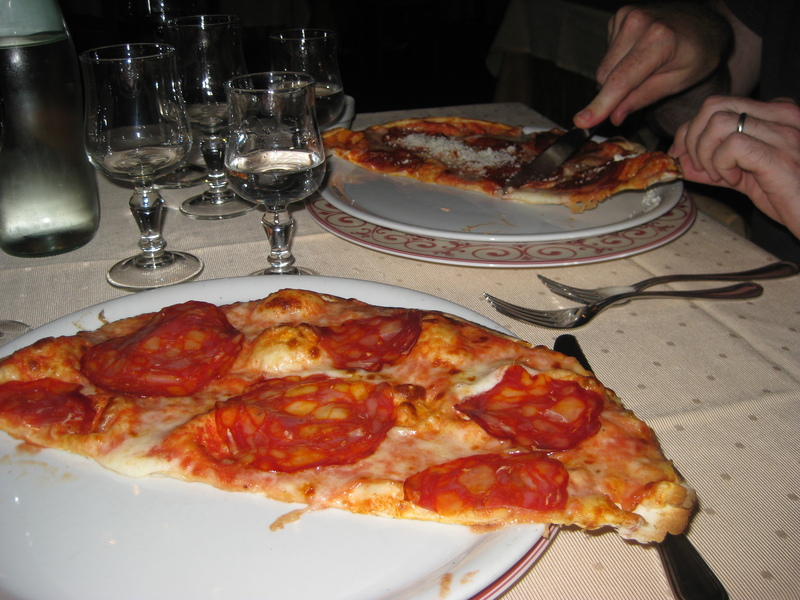 Needless to say, during our time in Umbria we went back to the delicious Palazzo del Papa for dinner, this time getting a pizza and confirming the legend that Umbria does indeed have the best salumi and cured meats. Hands down, best pizza I have ever put in my mouth. 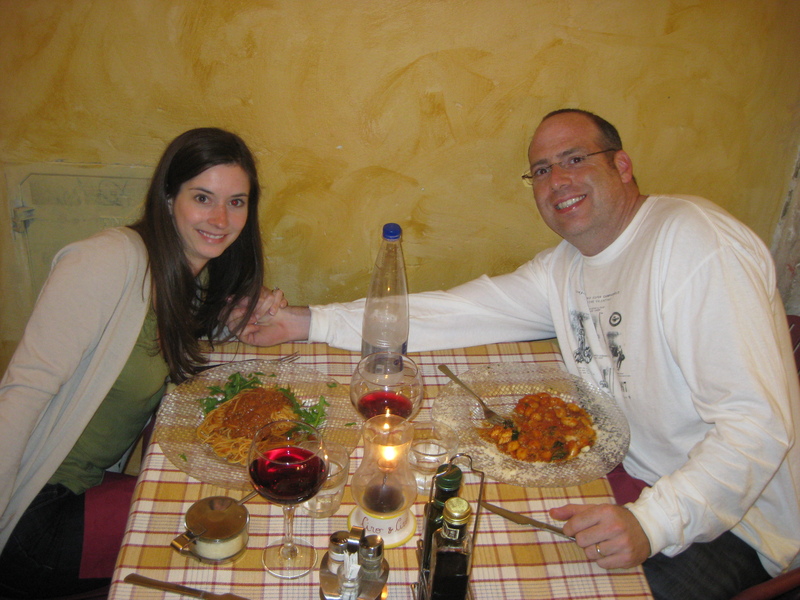 Another memorable meal was in Assisi, where we visited for a day of sightseeing. Those who know me well, know carbonara is my favorite pasta dish. As a child, my father and I would beg my mother to make it as much as she could. 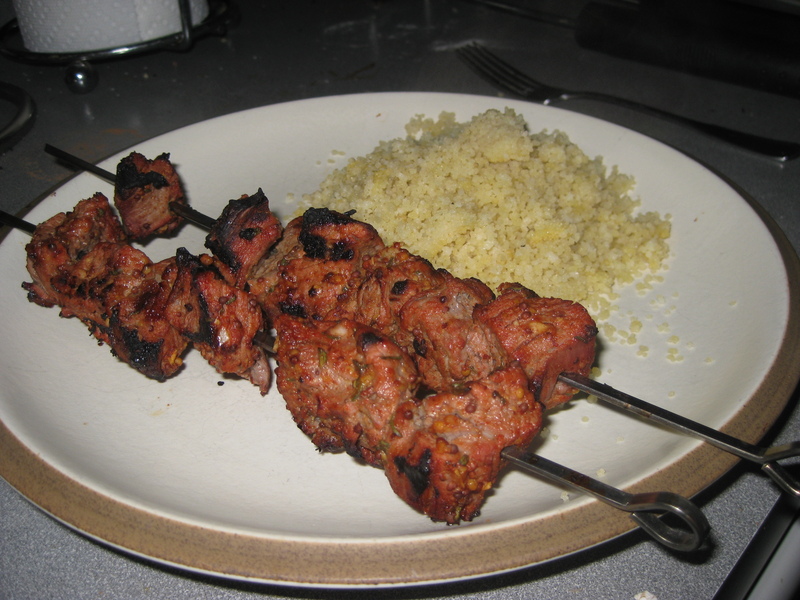 The whole trip I knew that certain dishes were only available regionally. 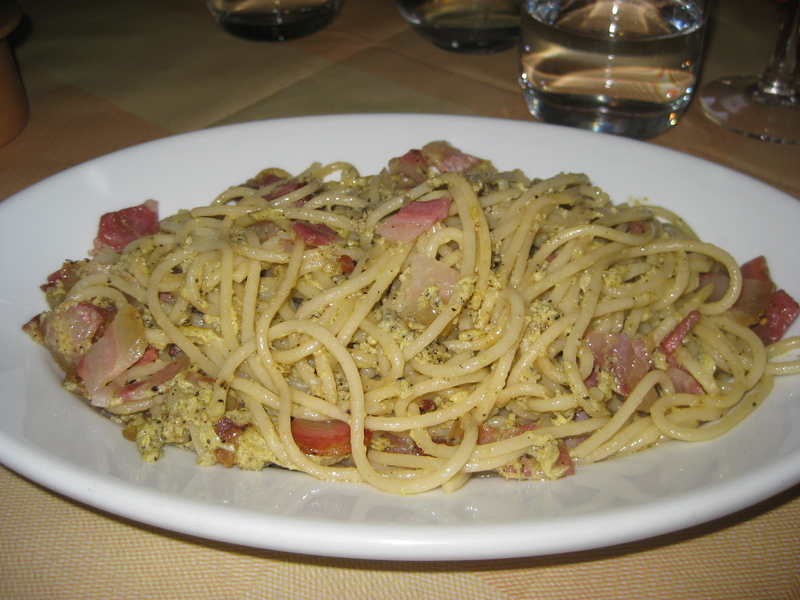 And although there were some exceptions (my husband had a mean carbonara in Venice), I knew in Umbria and Rome, we had entered “carbonara country.” So, for lunch in Umbria, I ordered my first plate of this heavenly pasta. 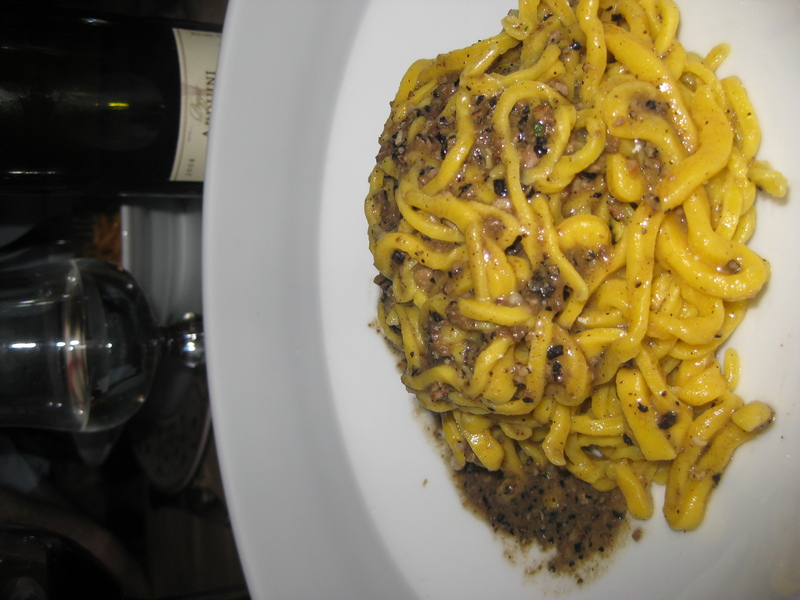 It was a drier carbonara – less of that heavy creamy sauce – which was perfect for lunch. The bacon was like none I have ever had. All and all, an amazing dish, and worth the long wait to experience it in its regional birthplace. Once we left the peaceful lands of the villa and entered clustered, noisy, crowded Rome, I will say we both experienced a bit of a culture shock. It took many different directions (GPS still broken) and near misses with other traffic to make it to the Hertz station to drop off our car. To boot, it was raining. Although, I have to admit, this was the first real rain of the trip (minus about 1 hour in Tuscany) so neither one of us was complaining. Once we got settled at our B&B, we realized it was pouring rain and we were starving. It was time for one of those typical 2 hour Italian lunches, while the rain would hopefully pass through. We ducked into a little place in an alley by our B&B – looked like it was filled with locals (good sign), looked crowded (also a good sign) and looked very unassuming (the best sign). We sat down, shook out our umbrellas and dug into the menu. 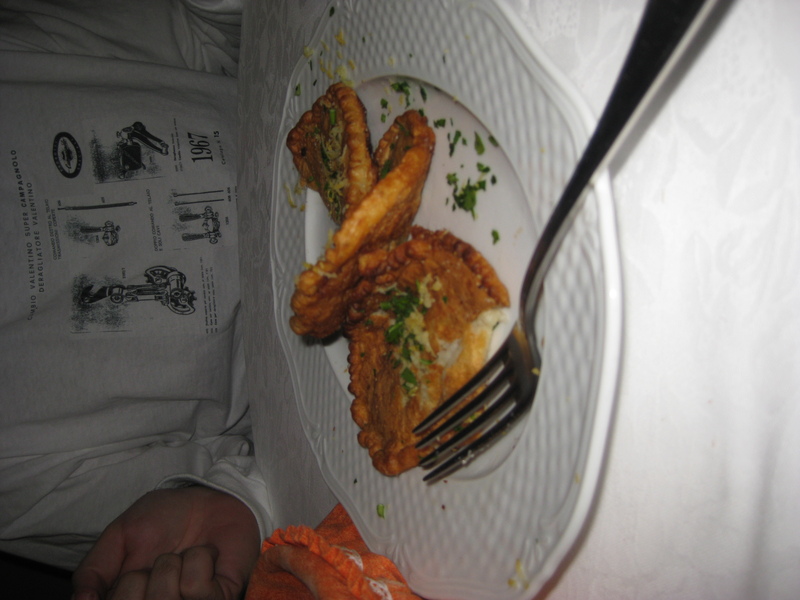 For an antipasti, we got baccala (cod fish) that was fried. 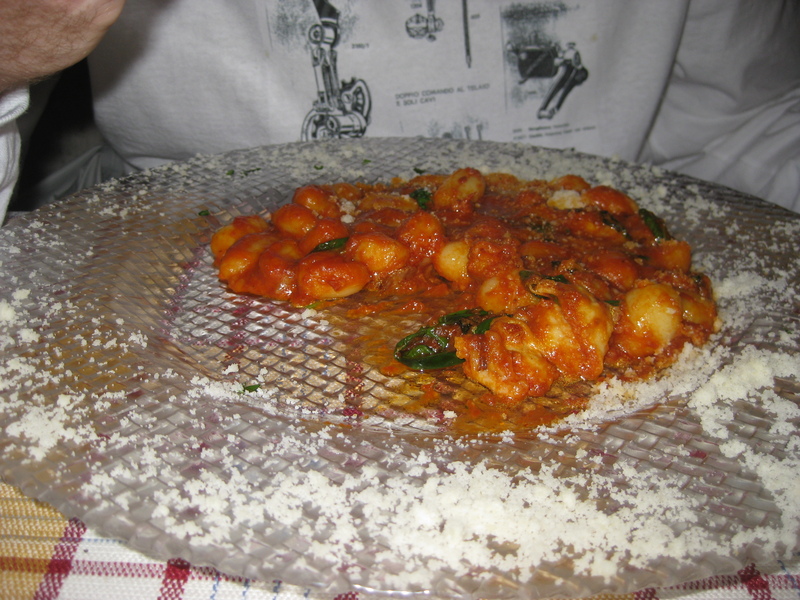 Despite its popularity in Italy, it was actually the first baccala we had on the trip. It was crispy and delicious. For our main meal I got, not surprisingly, carbonara. 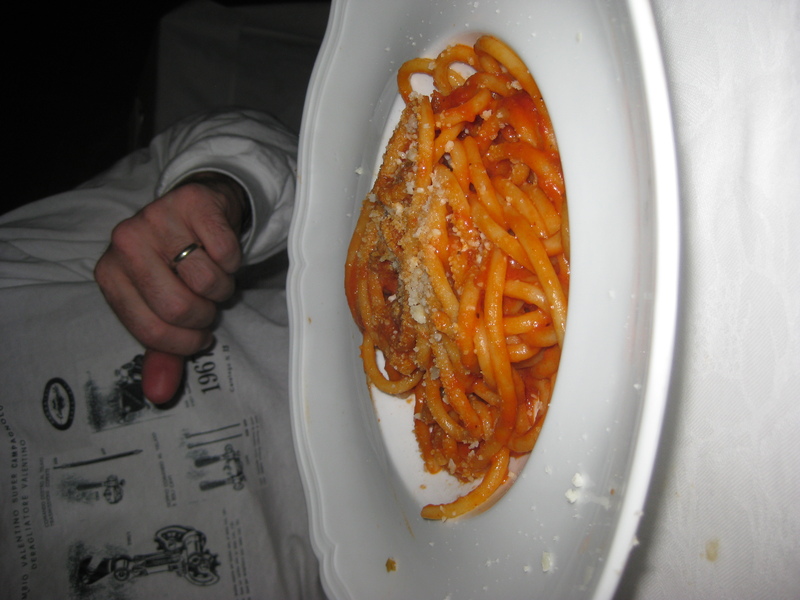 Rob got a bucatini (the spaghetti like strands with a hole in the center like a long tube), which has now become one of my favorite types of pasta. 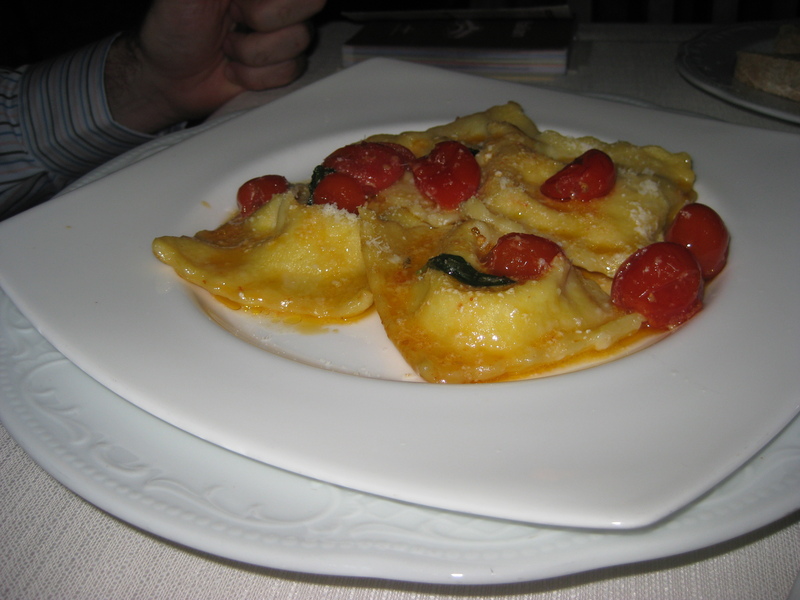 It was served traditionally, with a tomato sauce. They were both so flavorful, and the pasta was cooked to perfection. It seemed the perfect lunch in a cozy restaurant, while watching people trudge past in the rain. Then, we topped it all off with an espresso, to give us the energy to trudge in the rain ourselves. Our last evening in Italy, after a visit to the Trevi Fountain, we decided to eat in a popular area with outdoor restaurants, street performers, and amazing food. I will admit, I ate more food than I ever thought possible. But I realized that this time the next day, I would be getting whatever Delta airplane food they put in front of me on a plastic tray, so I had to load up on the good food while I could. 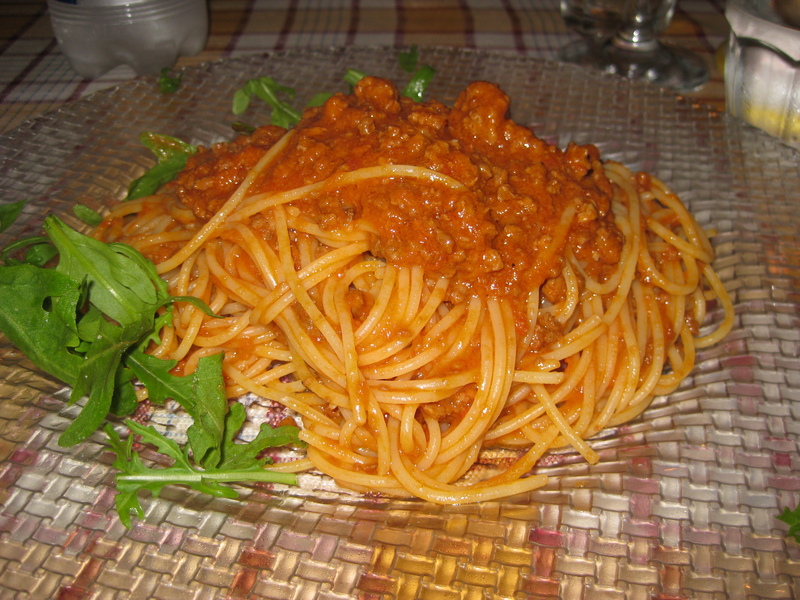 We did both primi and segundi and I had a craving for traditional spaghetti with a meat sauce. Yes, it sounds simple for my last meal, but I wanted to have that one, comfort food that I always think of when I think of Italian food. I wanted something traditional, after all of the amazing specialties we had throughout the trip. 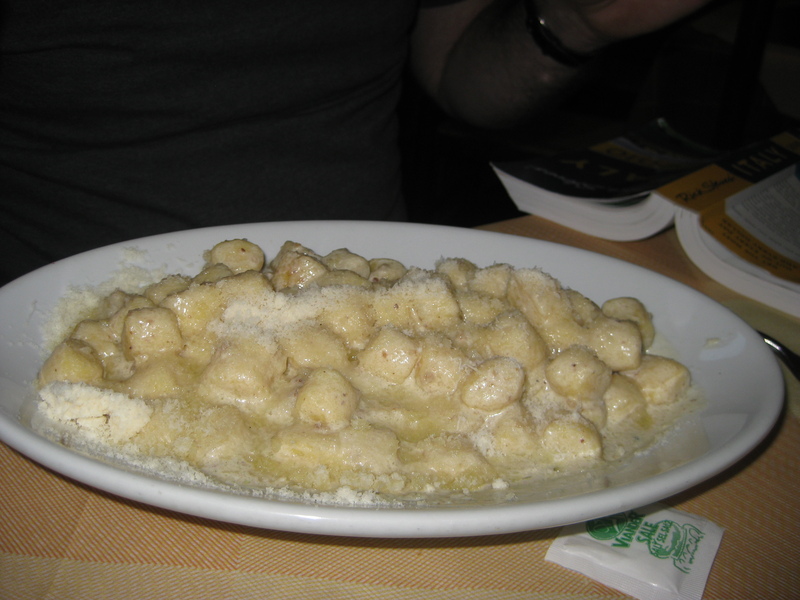 Rob got a gnocchi and we both got breaded veal for our main dish. We held off on dessert, knowing we could find some good gelato nearby. We were right. We literally followed the people with cones into what might be the closest thing I have ever seen to a gelato palace. 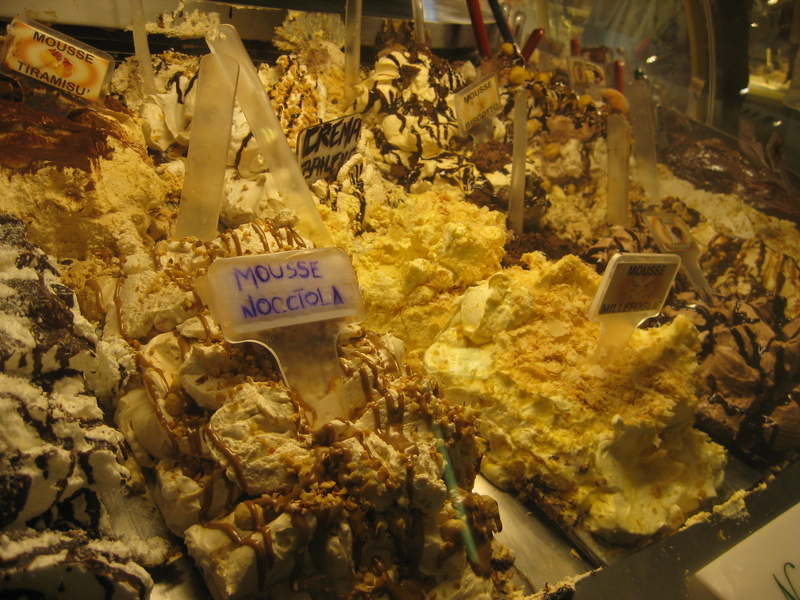 The place was huge, more gelato than I have ever seen in my life, and there was a system. You pay first. Of course, as clueless tourists we waited about 10 minutes before realizing the system, but once we did and got our cones, we knew it was worth the wait. Maybe it was because it was our last night, or maybe it was because I was eating ice cream that tasted like a candy bar, but it was the best gelato I have ever had in my life. 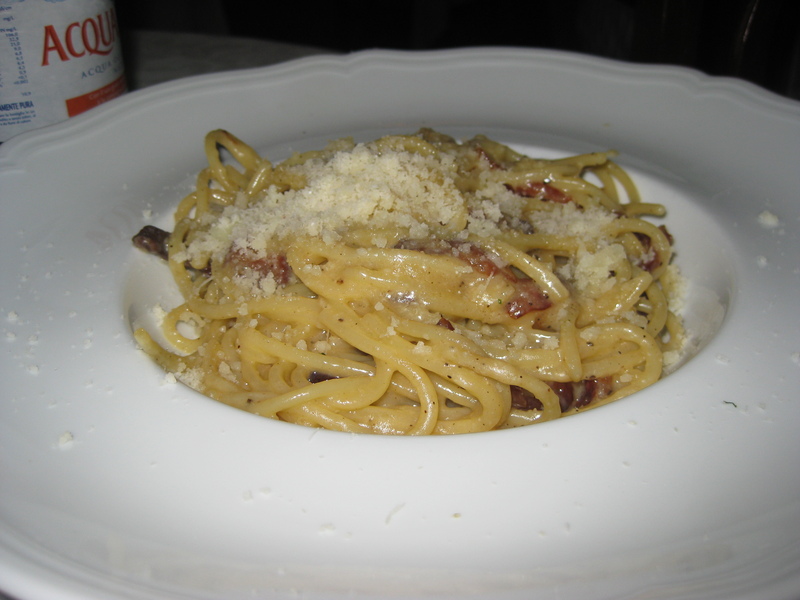 The cuisine of Umbria and Rome was not only memorable because I was able to experience carbonara, but because it was yet two more regions, with their own specialties. 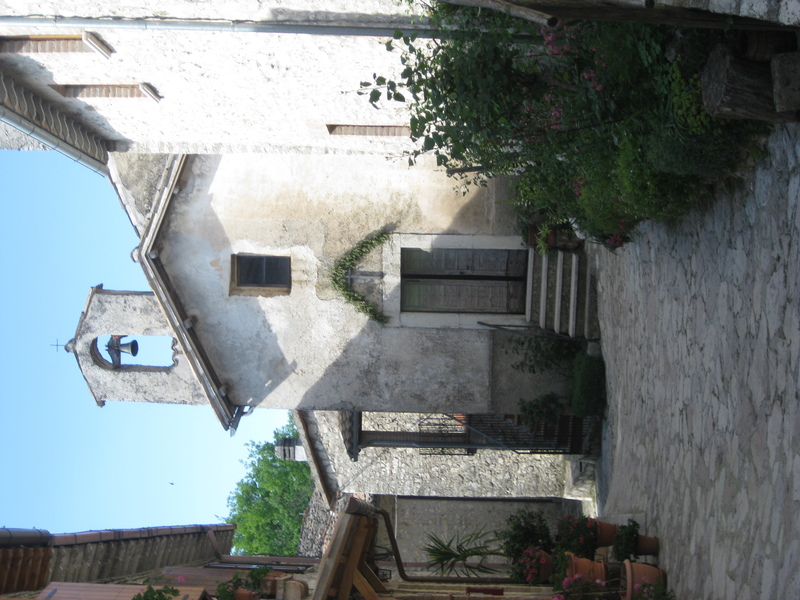 Umbria felt raw in its culture, Rome a bit more metropolitan. In Umbria, it was all home grown food prepared in traditional ways, in Rome you could get some pretty good Chinese food, I am sure. They both had their own personalities, and it was necessary to experience both to appreciate the differences. This part of my trip has a sentimental meaning to me. Not only because I renewed my vows with my amazing husband, but because it was my last few days in a country where I know I will be returning.